"Born Jean Browning in Central Illinois, this contralto established for herself a singular identity among singers of the deepest, darkest roles for female voice. Tall and strikingly attractive, she possessed both the physical and vocal allure for Carmen and created a riveting portrait of Klytemnestra, both addled and imperious. 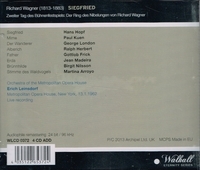 The later role, perhaps the one with which she was most closely identified, was captured on disc in both studio (with Bohm) and on-stage at Salzburg (with Mitropoulos). Her RHEINGOLD Erda in Solti's RING was likewise striking, voiced with steady, earth-deep tones, a sound once likened to 'gleaming anthracite'." Browning's father, half American Indian, half English, was a coal miner; her mother taught piano and soon included her daughter among her pupils. Upon her father's death, Browning moved with her family to St. Louis, where she won a scholarship to the Leo C. Miller School of Music. While a student there, she placed first in a competition whose prize was an appearance with the St. Louis Symphony. Under Vladimir Golschmann's direction, she performed Beethoven's Third Piano Concerto. In 1941, Browning entered the Juilliard School of Music, where she majored in piano, but also pursued singing, making her debut as Nancy in von Flotow's MARTHA in a 1943 Chautauqua Summer Opera production. At Juilliard, she met and subsequently married a piano student, Francis Madeira, who later became conductor of the Rhode Island Philharmonic, a faculty member at Brown University, and occasionally accompanied his wife following her transition to a full-time singing career. Olga Samaroff urged the young woman in 1946 to concentrate on becoming a professional singer. While still studying voice at Juilliard, Jean Madeira (as she was by then known) began making appearances with such other groups as the (American) San Carlo Opera Company. Gian Carlo Menotti chose her in 1947 to alternate with Marie Powers in the title role of his THE MEDIUM on its European tour. That same year, she was the recipient of the St. Louis Woman of Achievement Award. In 1948, she made her debut at the Metropolitan Opera as the First Norn in a performance of DIE GOTTERDAMMERUNG, beginning her steady progress through such roles as Amneris, Azucena, Ulrica, Orfeo, and Dalila. In 1954, she began a series of European appearances taking her to Covent Garden, Stockholm, Munich, and Salzburg. The fall of 1955 brought Madeira's debut at the Vienna Staatsoper in the role of Carmen, a triumph resulting in 45 curtain calls. When she sang Carmen at the Metropolitan in 1956, critic Irving Kolodin, writing in the Saturday Review, described her as 'an intelligent artist who gives thought to what she undertakes' and noted her effective use of her striking height. He also praised her portrayal by commenting, 'Mostly it was done with a suggestion of youthful suppleness not often seen'. In addition to her almost 300 Metropolitan performances in some 41 roles, Madeira continued to appear elsewhere in America and Europe, offering her Carmen at Chicago, where critic Claudia Cassidy praised her as 'svelte, darkly beautiful, with a mezzo soprano streaked in burnt umber and edged with a threat', and at Aix-en-Provence. Her authoritative Erda was heard at Munich, London, and Bayreuth. In 1968, she took part in the premiere of Dallapiccola's ULISSE IN BERLIN, creating the role of Circe. She retired in 1971, shortly before her death in 1972."